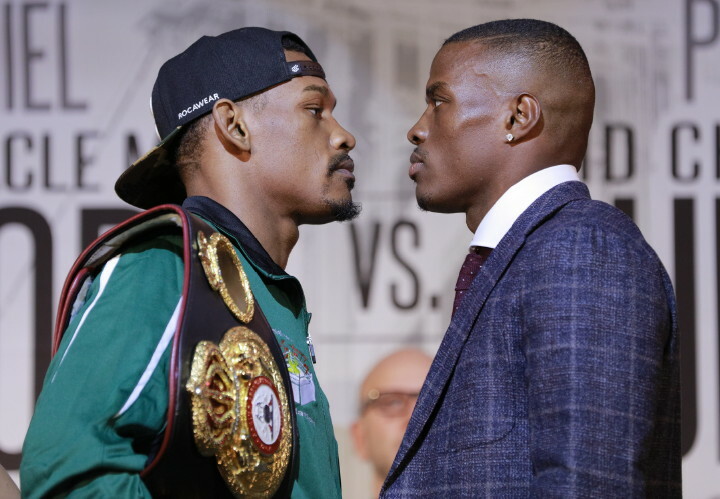 (Photo credit: Esther Lin/SHOWTIME) By Dan Ambrose: WBA “regular” middleweight champion Daniel Jacobs (30-1, 27 KOs) will be getting Gennady Golovkin type money this Saturday for his purse for his title defense against former WBO 160lb champion Peter “Kid Chocolate” Quillin (32-0-1, 23 KOs) for their match-up of the “battle of Brooklyn” on Showtime Championship Boxing from the Barclays Center in Brooklyn, New York. Jacobs and Quillin will both be getting $1.5 million for their fight. That’s the type of money that Golovkin is getting for his fights, and he’s seen by many boxing fans as the best fighter in the middleweight division by a lot of fans. “Purses for Saturday night’s big Barclays Center card: Jacobs $1.5M, Quillin $1.5M, Cuellar $200k, Oquendo $100k. #boxing #Jacobs-Quillin,” Dan Rafael said on his Twitter. This proves that it doesn’t matter if you’re not the best fighter in the division. If you’ve got the right backing in terms of promotional team or management, you can make very good money. Quillin, 32, is seen as the favorite in this fight. He passed up a nice payday last year to defend his WBO middleweight title against Matt Korobov. Quillin surprised a lot of people by vacating the title rather than facing Korobov and dealing with what would have been a difficult opponent. A lot of boxing fans believe that Quillin dodged the fight against Korobov because he was scared of taking the fight. The reason the fans felt this way is because Quillin had never fought anyone particularly talented during his career other than Hassan N’Dam, who a lot of fans see as having a weak chin. When Quillin was finally on the verge of fighting a solid middleweight in Korobov, he then vacated his WBO title rather than take the fight. That didn’t look good in the eyes of a lot of fans. Qullin has since faced Andy Lee and battled to a 12 round draw last April. Jacobs, 28, is facing his toughest test in quite some time. Jacob’s was beaten badly by Dmitry Pirog by a 5th round knockout in 2010. Jacobs has since won his last 10 fights, but he’s faced very weak opposition. The best opposition he’s faced in the last five years was Sergio Mora and Caleb Truax. Those guys aren’t considered dangerous fighters. They’re more like bottom feeder/fringe contenders in the division. You can say that Quillin and Jacobs are both totally untested fighters despite both of them having been pros for many years. Jacobs was tested and he failed miserably against Pirog. Quillin had a minor test against Andy Lee last April, and he didn’t pass the test. A real test would be for Quillin and Jacobs to fight someone like Gennady Golovkin, Miguel Cotto or Saul “Canelo” Alvarez, and none of those fights have happened. Quillin has been fighting guys like Gabriel Rosado, Michael Zerafa, Lukas Konecny, Fernando Guerrero, N’Dam, Winky Wright, Craig McEwan, Jason LeHoullier, Jesse Brinkley, Dennis Sharpe, Martin Desjardins and Fernando Zuniga. Those are not quality fighters. Quillin has been fighting weak opposition for pretty much his entire career until he faced Lee, and had to settle for a draw. The winner of the Jacobs vs. Quillin fight will be able to get another nice payday defending the WBA title against the winner of the Chris Eubank Jr. vs. Gary “Spike” O’Sullivan fight in 2016. That’ll be interesting if Quillin had the WBA title and chooses to vacate the belt rather than face the winner of this fight. They’re calling the Quillin vs. Jacobs fight the “Battle of Brooklyn.” However, there already was a “Battle of Brooklyn” fight that took place two years ago between welterweights Zab Judah and Paulie Malignaggi, and it was a real snoozer. Hopefully the second “Battle of Brooklyn” is better than the first one because the Malignaggi-Judah fight was virtually unwatchable due to the lack of action. There’s not much on the Quillin vs. Jacobs card in terms of interesting fights. The co-feature bout is between WBA featherweight champion Jesus Marcelo Andres Cuellar and Jonathan Oquendo. Cuellar is a decent fighter, to be sure. But he’s seen by a lot of boxing fans to be a paper champion at featherweight. In other words, a lot of fans see Cuellar as the worst of the featherweight champions. There are currently 5 featherweight champions, and the champions that many of the fans rate ABOVE Cuellar are as follows: Vasyl Lomachenko, Gary Russell Jr., Leo Santa Cruz and Lee Selby. It’s hard to disagree with the fans there. I don’t see Cuellar as being in the same class as any of those champions. For that reason, I’m not interested at all in seeing Cuellar fighting anybody. He’s someone that I would rather have fight on the off TV part of the Showtime broadcast.